I remember vividly the times I got to see Mulgrew Miller perform live. If I was lucky I’d be sitting close to the piano, watching waves of concentration ripple over his face, feeling his deep appreciation of the present moment and the infectious joy of making music. This song is named after one of his bands, or maybe it’s the other way around. This entry was posted in Uncategorized and tagged jazz, lead sheet, Mulgrew Miller, music, Noteheads, transcription, Wingspan on April 24, 2019 by noteheads. Here’s a pretty James Williams song that I’ve heard covered by some of the piano players he’s influenced. This entry was posted in Uncategorized and tagged Alter Ego, James Williams, jazz, lead sheet, music, Noteheads, transcription on April 15, 2019 by noteheads. This tune by pianist Darrell Grant isn’t exactly a blues, but it follows the same road map. The melody is two statements of a phrase, once over the tonic chord and again over a subdominant, followed by responding phrase that passes through the dominant back to the tonic. Extra material in the form of a nice intro and interlude makes for a well-rounded and interesting composition. This entry was posted in Uncategorized and tagged Darrell Grant, Gettin Mean with Mateen, jazz, lead sheet, music, Noteheads, transcription on April 7, 2019 by noteheads. I love the bass playing of Reggie Workman. He is always listening attentively to his bandmates, matching their intensity and prodding them to new heights without stealing the spotlight. On this Freddie Hubbard blues, he gets a short walking feature out front to set up the tempo. 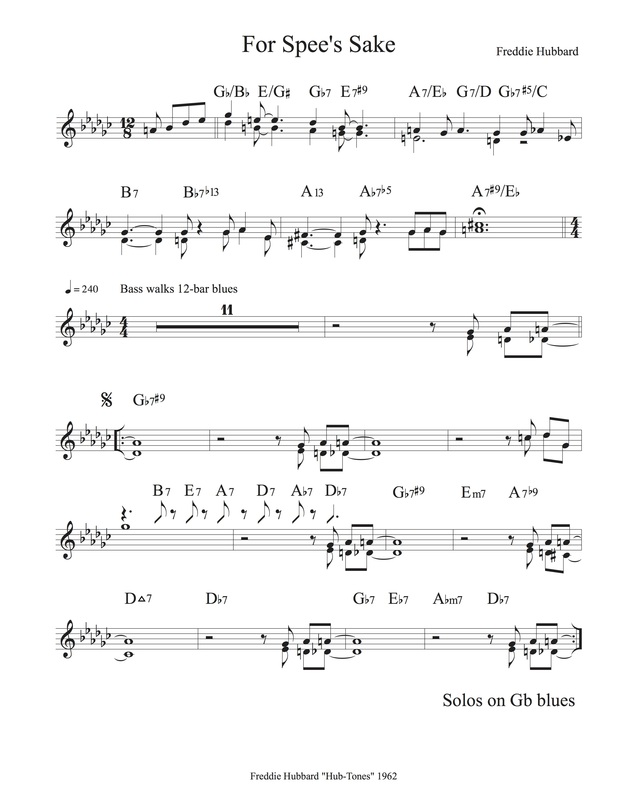 This entry was posted in Uncategorized and tagged blues, For Spee's Sake, Freddie Hubbard, jazz, lead sheet, music, Noteheads, transcription on March 30, 2019 by noteheads. This suspended blues is by pianist Kenny Barron, as recorded by the Sphere quartet. I posted another blues by Charlie Rouse from this album back in October, and I’ll probably post a third by Buster Williams soon. I like the way the melody centers around an A natural, which adds some bluesy dissonance when it clashes with the suspended 4ths of the F and Eb chords. This entry was posted in Uncategorized and tagged blues, jazz, kenny barron, lead sheet, music, Noteheads, Saud's Song, transcription on March 23, 2019 by noteheads. This is one of the previously unheard John Coltrane compositions from last year’s much-touted release Both Directions at Once. It’s a treat to listen to any collaboration by this great band, even if it sounds more like a ‘first draft’ than a coherent and polished Trane album. At first glance, the tune seems very similar to the Benny Golson blues we looked at the last two weeks; it’s a fast 12-bar blues in the key of Bb, and features a Gb7sus chord in the turnaround. This time, though, there is no predictable move to F7 in bar 10, so there’s no strong tonal resolution. The melody and harmony both avoid the D natural that would put us firmly in the key of Bb major, and the band continues this ambiguity right on into the solos, while Golson’s tune switches to a standard major blues for the band to solo over. This entry was posted in Uncategorized and tagged blues, jazz, john coltrane, lead sheet, music, Noteheads, transcription, untitled original 11383 on March 14, 2019 by noteheads. For this year’s “blues March” I think I’ll post blueses built on suspended chords, rather than major or minor. “The Stroller”, from Benny Golson’s Groovin’ with Golson album, starts at a brisk 280 beats per minute, but by the time the band gets to the thick of the solo section it has well surpassed 300bpm. Paul Chambers gives an especially energetic performance, including 9 choruses of arco bass solo that I’ll show you next week. This entry was posted in Uncategorized and tagged Benny Golson, blues, jazz, lead sheet, music, Noteheads, The Stroller, transcription on March 1, 2019 by noteheads.